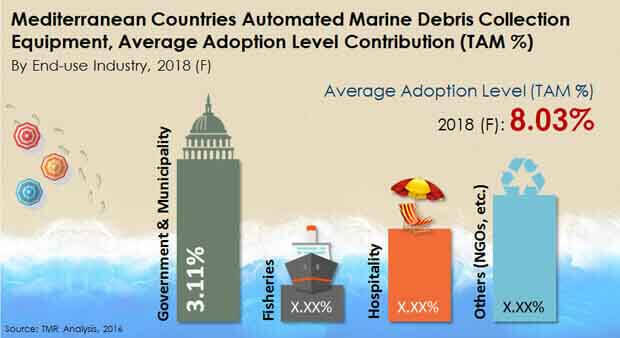 The demand within the global market for automated marine debris collection equipment has been rising on account of the growth of marine operations across multiple regions, finds Transparency Market Research (TMR). Marine debris collection equipments are specially designed to withstand harsh marine environments and collect harmful wastes. Several providers of automated marine debris collection equipment have lately emerged in global markets. The leading vendors in the global automated marine debris collection equipment market have invested in research and development of improved technologies. The advent of automation technologies has given an impetus to the growth and development of vendors within the global automated marine debris collection equipment market. The global automated marine debris collection equipment market is projected to witness the emergence of several new players in the years to come. Despite the high cost of investment required to enter this market, global entities are barging into the automated marine debris collection equipment market. Furthermore, due to the scantiness of vendors, the barriers to market entry have been loosened in the global automated marine debris collection equipment market. Some of the key vendors operating in the global automated marine debris collection equipment market are Liverpool Water Witch Marine and Engineering Co. Ltd., United Marine International, and Harbor Clean. Transparency Market Research (TMR) finds that the global marine debris collection equipment market market would expand at a sustainable CAGR over the period between 2016 and 2024. The market for marine debris collection equipment market is also projected to accumulate voluminous revenues by the end of the forecast period. On the basis of end-use, the demand for marine debris collection equipment market in the fisheries sector is expected to rise. Based on geography, the market for marine debris collection equipment market in Europe is slated to expand at a stellar CAGR. Marine debris poses a severe threat to the ecology and environment, and hence, there is a pressing need to regularly collect marine debris. The regions that are near marine bodies have shown a sense of responsibility in clearing marine waste and debris. This factor has played a a major role in the growth of the global marine debris collection equipment market. Furthermore, the municipalities have started buying marine debris collection equipment in order to regularly clear waste generated by them. Hence, the cumulative value of the global marine debris collection equipment market is expected to escalate in the years to come. Marine debris includes several types of wastes generated from fisheries, hospitals, construction units, and other similar avenues. Furthermore, wastes from ships and vessels also contribute towards marine debris. Hence, there is a dire need for marine debris collection equipment market across the world. Wreckage of ships and vessels results in the huge mass of several waste materials being submerged in the water body. This factor has also led to a dire need for marine debris collection equipment market across the marine industry in recent times. The review is based on TMR’s report titled, “Automated Marine Debris Collection Equipment Market (End-use Industry - Government and Municipality, Fisheries, Hospitality) - Mediterranean Industry Analysis, Size, Share, Growth, Trends and Forecast 2016 – 2024”.